Home to the "World's Greatest Steeplechase", Aintree stages the Grand National in April as the highlight of a top class three-day meeting. The course only stages seven days racing this year but the Becher Chase meeting in mid-November is another very decent meeting and one which includes a spin over the National fences. 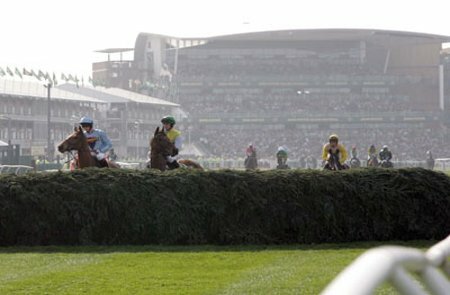 Aintree has two courses, the Grand National and the Mildmay. The former is two-and-a-quarter miles round and includes famous fences such as Becher's Brook, the Chair and Canal Turn. It is perfectly flat and has a run-in of 494 yards, including the Elbow. The Mildmay track is a sharp, mile-and-a-half circuit. The birch fences are stiff in nature. Aintree Racecourse is located on the A59, just one mile from the junction of the M57 and M58, which link to the M62 and M6. Follow the A59 to Liverpool, and the AA signs as you approach the racecourse for routes to the car parks. Parking costs anything from free to £25.00. Regular services are available from most major cities to Liverpool Lime Street. Local trains go to Aintree station, which is located two minutes away from Pedestrian Entrance 2. Regular flights to Manchester Airport (40 minutes from the racecourse) or to Liverpool (20 minutes from the racecourse). If you are considering placing a bet on any of the horse races at Aintree Racecourse, you’ll want to make sure you get the best odds and perhaps a free bonus to boot! And with that in mind, we highly recommend checking out the online sportsbooks featured below. Each of these online sportsbooks offer great odds on all of Aintree Racecourse’s races and they all have a fantastic welcome bonus available to all of their new customers! This is the perfect opportunity for you to make a tidy little profit, so be sure to visit these online sportsbooks today to learn more about their new player welcome bonuses! If you’re looking for a trustworthy online sportsbook, then you should definitely check out Paddy Power. They have been in business for more than a decade and they are well respected throughout the betting industry. The great thing about this online sportsbook is that they are currently giving away $50 in free bets to all of their new customers, which gives you a chance to give your bankroll an instant boost! There’s no telling how long this promotion will run for, so be sure to visit Paddy Power today to get your free bonus money before it’s too late! Click here to bet on Aintree races at Paddy Power! At Bet365, an established and respected online sportsbook, all new customers are currently eligible to receive up to $200 in free bets just for signing up. This is one of the biggest online sportsbook bonuses that we’ve come across, so we encourage all of our website visitors to take advantage of this offer before it’s too late! Bet365 is one of the oldest and most popular sportsbooks, which is why we never hesitate to recommend them to any of our website visitors! Click here to bet on Aintree races at Bet365! If you’re looking for a reputable online sportsbook that features races from around the world, including all Aintree Racecourse races, you are sure to love the one and only Ladbrokes. They are one of the oldest sportsbooks in the world, both offline as well as online, and we’re confident that you’ll be impressed with everything they have to offer! Right now, they are giving away up to $50 in free bets to all of their new customers, so visit Ladbrokes today to get your free bonus money while supplies last! Click here to bet on Aintree races at Ladbrokes! Bodog is one of the most well known online sportsbooks and they proudly accept customers from around the world, which is why we are happy to recommend them to all of our website visitors. At Bodog, you can bet on virtually every race imaginable; including all of the races at Aintree Racecourse! At the moment, all new customers at Bodog are eligible to receive a free bonus after making an initial deposit, so visit their website today to learn more about this great offer! Click here to bet on Aintree races at Bodog!